In the wake of the Randy Moss trade, Boston Herald football writer Ron Borges reacted to those who held the opinion that in some ways it could make the team better, whether it be in style or toughness, or whatever by loudly screaming “THERE IS NO NUMBER HIGHER THAN ONE!!! THERE IS NO NUMBER HIGHER THAN ONE!! !” Of course, Ron has long since been disgraced as a journalist by getting nabbed for plagiarism some years ago. And he’s generally considered a raving lunatic who has been proven time and time again to have little to no football acumen. But the point he was trying to make, apparently and albeit with dreadful debating skills, was that the Patriots ranked number one in offense at the time of the Moss trade, so how could they possibly be better? The San Diego Chargers, who the Patriots will meet this week in Southern California, are the ultimate example of this. Even Ron Borges, as demented as he is, would have a difficult time with his “argument” when looking at the Chargers. Why? Because they are “number one” in both offense and defense the way the NFL ranks these things. Number one in both. In addition to that, They’ve thrown for more yards than any other team and average 4.3 running it. On defense, they’ve given up less passing yards than any other team, only 3.7 per rush and are 2nd in the NFL in sacks with 21. And yet, the San Diego Chargers are 2-4. If presented with these numbers, a simpleton like Ron Borges’ head might explode. But really, it just proves the point. Rankings don’t necessarily equal wins. And there are a lot of numbers higher than 2 wins when you’ve played six games. Yet, those are the facts. Ranked number one in offense and defense, yet 2-4 record. That’s who the Patriots will be playing this Sunday. So lets take a look at some of the key players for San Diego to this week’s game. Philip Rivers (#17), Quarterback: As a Patriots fan, I don’t particularly like Rivers. I think he is a whiner, sore loser and sulks too much for a professional athlete. And he’s never led his team to its potential in the post-season. But my respect for him did grow by leaps and bounds when he played in the AFC Championship Game after the 2007 season against the Patriots with a torn ACL. This was on a very cold day. He gutted it up, played decently and even the Patriots took their hat off to him. And believe it or not, his career 96.3 QB rating ranks second all-time to Steve Young. Even higher than Tom Brady’s. For this year, Rivers has a 100.7 rating which if it continues would be the third consecutive season Rivers has a 100+ rating. He’s completed 62.3% of his passes and has a 12-5 TD/INT ratio. He’s not that mobile and has been sacked 18 times, but he is a very good quarterback who’ll be playing at home and the Patriots at times have struggled versus the pass this season. So, he is obviously a key player in the game who if he gets hot, could cause a very long day for New England. 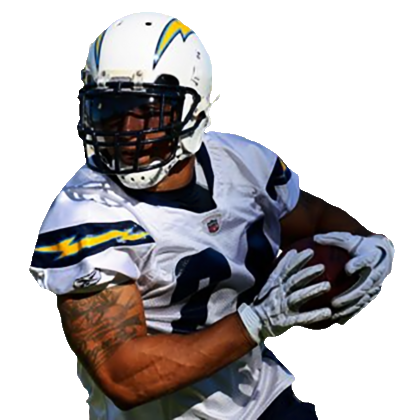 Ryan Mathews (#24), Running Back: Mathews was the second running back taken in last year’s NFL Draft taken at #12 overall. Mathews attended Fresno State (and incidentally shares the same agent as the Patriots Logan Mankins) and had a good, if pedestrian, career there up until his last season. Mathews, who was not considered a top recruit coming out of high school, was born to a single mom who was 16 when she had him and was abandoned by his father before he was born. Mathews has only seen his father a couple times in his life. As a senior, Mathews really progressed and seemed to pick up size and speed that brought him to the next level of player. He tested well at the combine and worked himself from a relatively smaller program to a 1st round pick. He’s off to a solid start to his NFL career, averaging over 5 yards per carry. He did miss two games to an ankle injury that some reports have him still slightly slowed by. One thing to watch, he lost fumbles in both of his first two NFL games, so perhaps that is an area the Patriots can look to exploit. He is merely an average receiver out of the backfield and the Patriots need not pay any particular special attention to him in that area of the game. Malcolm Floyd (#80), Wide Receiver: With San Diego’s top receiver, Vincent Jackson unsigned, the Chargers have turned to Floyd to become their go-to wide receiver. So far this season, he has responded spectacularly. Two weeks ago, Floyd put up an incredible 213 yard receiving performance. He had only had 2 previous 100 yard days since coming into the league in 2004, so it was a sign that Floyd really has blossomed into a true #1 receiver. But unfortunately for him and the Chargers, Floyd hurt his hamstring this past Sunday and it appears likely he won’t play versus the Patriots. If he can’t go, the Chargers will have to make due with their other receivers such as Patrick Crayton, Buster Davis and Legedu Naanee. Its an area to keep an eye on whether Floyd will be able to get on the field or not and could affect how well the Patriots are able to handle San Diego’s highly ranked passing attack. Antonio Gates (#85), Tight End: Gates is the best receiving tight end in the NFL and off to a spectacular start this year, perhaps the best start of his career. Using Gates, the Chargers would still have the formidable presence of Gates for Patriots pass defenders to deal with even if Floyd were out. But, like Floyd, Gates was also injured Sunday and it is uncertain whether he will be able to go either. Initial reports on Gates however, appear more favorable than on Floyd and after a MRI yesterday, the Chargers are hopeful he’ll suit up. The injury has been determined to be a sprained toe and if Gates can deal with pain, he should be able to play. On the field, he is as dangerous a seam receiver as the league has ever seen. Good around the endzone, he’ll challenge the Patriots safeties’ coverage abilities and he’ll certainly make his share of plays regardless of how well the Patriots play on defense. He is just that good. If the Patriots can at least limit his damage, that is all you can really ask for as he will get his catches one way or the other. Antonio Garay (#71) Defensive Tackle: Garay is an interesting story to Bostonians because way back in the day, he was a star defensive lineman for Boston College. Something happened with Garay, though the story has never exactly been clear. A truly dominant college player, he seemed to be drafted lower than he should be in the 6th round when he came to the NFL in the 2003 draft. Garay lasted one season as a rarely-playing rookie with Cleveland in 2003, and then appeared to be out of the league for good. After last playing in a NFL game on December 21, 2003, suddenly Garay reappeared with the Chicago Bears nearly three years later, getting into a game October 8, of 2006. He appeared in ten games over the 2006 and 2007 seasons for the Bears before being let go again. He didn’t play at all in 2008. Midway thru the 2009 season, Garay, who was now almost 30 years old and had played in 14 NFL games since 2003 and hadn’t even been under contract since following the 2007 season, once again suddenly reappeared in a comeback tryout and earned a spot on the New York Jets practice squad in October. In December, the Chargers signed him off the Jets practice squad and he got in a couple games for them towards the end of the year. Now, here in 2010 and with Garay to turn 31 next month, he has finally become a starter for the Chargers and racked up 17 tackles and his first two NFL sacks. That’s a true story of perseverance for him and with a local angle. I will try to make a point to watch this guy, who I remember as dominant in college to see how he is doing. Kevin Burnett (#99), Linebacker: Burnett is another story of perseverance for a Charger defender. A second round pick for Dallas in 2005 out of Tennessee, his career has largely been considered a disappointment and he’d been considered a bust up until this season. A fast, quick, smaller coverage linebacker, Dallas mostly used him inside as a coverage linebacker in his time there. This year, his second with the Chargers, he’s finally become a full-time starter as the Chargers use him outside and are giving him a chance to be a playmaker as a blitzer. He’s responded with 5 sacks thru 6 games. A fast guy, he could give Matt Light some trouble on the edge. He also does drop into coverage some and has an interception and 4 passes defended. He’s an able tackler. Now 27 years old, it seems Burnett has finally found his niche with the Chargers and giving them the dual outside linebacker threat (along with Shaun Phillips) they had when Shawne Merriman was healthy. He’ll certainly be a guy the Patriots will have to account for as a pass rusher and cover guy on passing downs. I think Rivers will throw for close to 400 yards in this game…but S.D. still loses. The numbers, while impressive for S.D., don’t tell the whole story with them. Rivers tosses his fair share of INT’s and loses plenty of fumbles. They don’t even try to run the ball. This might be a high scoring game. I agree. Could be very high scoring. Its definitely worth watching to see Floyd and Gates’ statuses. Apparently Naanee is banged up too. Rivers can make some plays, but I agree he also gives the ball away sometimes too. Which fits the Patriots defense. It gives up plays, but has also been turnover proficient as well. Rivers actually doesent throw many interceptions. Hes usually at the bottom of the league in INT and a big reason why this is his 3rd consecutive season with a triple digit QB rating. The 5 this year have come from having to come from behind due to special team miscues. These are also the primary but not sole reason for the lack to yardage in the run game. The Chargers YPC is near the top of the league but considtently abandons the run in the second half due to large scoring deficiets. This game is the death knell in my Chargers season. After a huge game from Rivers the Chargers still lose 27-21. Outside of a win the thing I’m anticipating the most is River’s pout-face and temper tantrum – it’s second only to Peyton. It’ll be interesting to see what Belichick does to contain Gates. I hope the young D doesn’t take a step back – I think they got too confident after the Bengals win and we know what happened the next week. Also the Charger’s D is very good against the pass – maybe BenJarvus can lay a little hurt on the Chargers in the first half before Brady kills them with play-action in the second. It’ll be a good entertaining game. I agree with the thinking regarding the D. They will still have set backs. This isn’t 2003 and 2004 when the Pats just roll to win after win and the defense doesn’t have many ups and downs. They’re young. They won one on the road, doesn’t mean they can’t fall back into bad habits again. But I’m fairly optimistic about this game. While I think San Diego is better than a 2-4 team and at home, I don’t think they’re as good used to be. And they’re a bit banged up. I anticipate an exciting game with lots of plays on offense. Turnovers, mistakes and special teams should make the difference. I doubt it’ll be a blowout either way. Pats put up 200 total yards on offense, media is at a loss for how they win. Because their 350 yards on punt and kick returns don’t count towards the offense.